We are used to viewing Elba as a holiday destination with beaches, the sea, walking, biking, which are all obvious main attractions of the place but it is not as well known now for its agriculture as in the past, along with its mining activities and the extraction of granite, which used to be one of the strengths of the economy. Suffice it to say that now the surface covered by vineyards is one-tenth that of the ’30s. Now the vines are grown mainly on the plains rather than the hills, which have been taken over by scrub and forest, years ago they were terraced and the vineyard virtually painted the landscape. At that time Elba was the third largest area of wine production in Tuscany, only after Chianti and the Montalcino area, and exported the juice and grapes to the Tuscan coast and to Liguria. There were hundreds of miles of terraces that covered the hills of the island. With the tourism boom of the 60 farming had become residual and was used just to support a family’s economy.Since the late 80’s this cycle has begun to go in reverse, thanks to the dedication of people who believed and invested in quality. It is also due to the contribution of winemakers and agronomists who have transformed the way we grow and produce wines of good quality to meet the taste of customers, and the intelligence of many Elban producers who understand the importance of focusing on quality of their products, on the premises of the territory and the landscape of the island. Zappaday is an initiative designed and created by Antonio Arrighi with the help of Riccardo Galletti and family to create an opportunity to raise awareness among school children by showing the techniques, tools and traditions of grape growing that Elba has had, and furthermore still has so much importance to the economy and culture of the island. 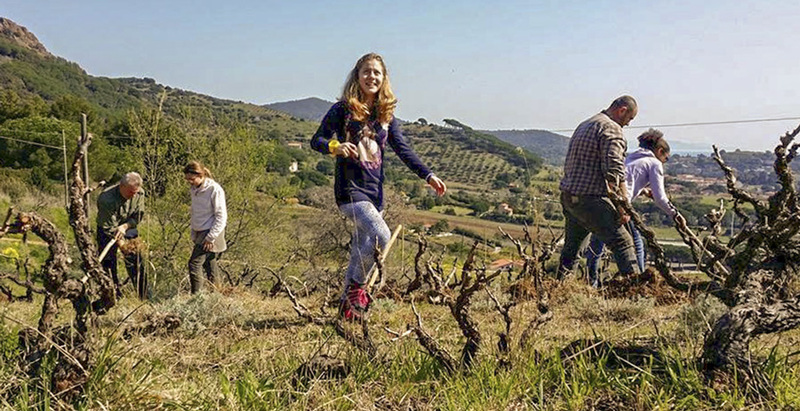 It ‘was a proud meeting of wine growers who found themselves on a beautiful day in early spring on the Galletti farm in the Monte area of Porto Azzurro overlooking the bay next to Montserrat.A party where the children were invited to try the mattock or “Gaglione”, as it is called, depending on the latitude in which we live or “guaglione” or “corno”! The children were happy to spend a day outdoors, but even happier were the diggers and organizers for this re-enactment that brought together different generations and to convey the love for this land that has given so much to them and what they gave back was a lot of energy. And lunch in the yard at the end!